I wanted to watch the new Ip Man movie ever since it came out. Finally, I had my chance. The Chinese Moon Festival came around and my woman (Chinese) wanted to go out and eat yummy Chinese food. “Should we go somewhere local?” she asked. “No. Let’s go to Chinatown” I said. 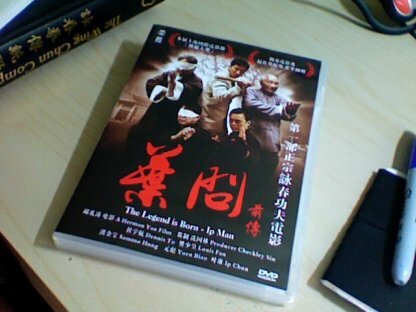 Yes, the Chinese food is better out there and our new favorite spicy Yunnan restaurant is there too… but the real reason I wanted to drive over an hour in traffic was because I wanted to buy "The Legend is Born - Ip Man” (part 3 in the Ip Man movie trilogy). We got to Chinatown and looked for a video store. We weren’t sure where to find one so we drove around for a bit, in more traffic. Finally, I saw one and made a U-turn. I parked by the curb and jumped out of the car. My woman stayed behind. She wanted me to hurry up so we could eat. I ran in. There was one man working, alone, and he was watching a video. No one else was in the store. He looked up from his video and stared at me. I’m Asian - I look Asian. When I speak my chopped up Chinese in a place like Chinatown, people think I speak funny because I’m mentally slow. Not because I’m not Chinese. This man spoke Mandarin, not Cantonese. The Chinese language has many dialects and often times Chinese who speak different dialects can’t understand each other. The word “Ip Man” and “Wing Chun” are from the Cantonese dialect pronunciation. “Have Ip Man? Three? Movie? New one?” I said in Chinese. He wasn’t happy either. I was interrupting his video and now he thinks he’s talking to someone with a mental illness. After about 5 minutes of pantomime and mores-code-Chinese and no success, I remembered how to say Wing Chun in Mandarin - Yong Chun!?. And as if I had said “open sesame”, he got it. Which is how you say Ip Man in Mandarin - Ye Wen. I would have never guessed that. I found a copy, bought it and now all is good.